9 - Always Michigan Cottage, (219) 322-2811. 19 - Bo Sloan's Hideaway, (805) 312-0098. 19 - Cameron's Cottage, (256) 771-1057. 9 - Cattail Cottage, (231) 843-2767. 6 - Clark's Castle Point Resort, (231) 843-4594. 1 - Grace Landing, (231) 907-8795. 3 - Heaven on Hamlin, (231) 843-8831. 10 - Hobby Crest Resort, (231) 845-0661. 19 - Jennings Cottages, (231) 843-0759. 7 - K's Edgewater Resort, (231) 843-3322. 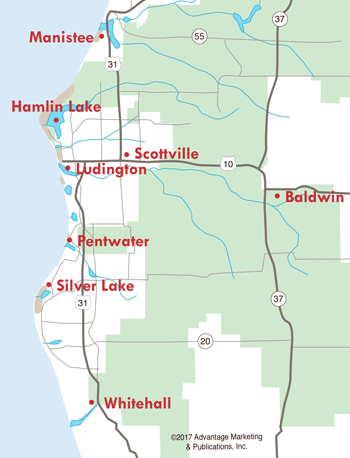 11 - Ludington Vacation Rentals, (231) 757-3217. 5 - Peaceful Acres Resort, (231) 843-2292. 13 - Sauble Resort, (231) 843-8497. 26 - Shining Light Inn, (231) 425-3521. 3 - Sunny Birch Resort, (231) 843-4074. 15 - Sunset Bluff Resort, (231) 845-5002. 17 - Waterside Resort, (231) 843-8481. 18 - Willow-by-the-Lake Resort, (231) 843-2904. 8 - Lakeview Campsite, (231) 843-3702. 4 - Concessions & Watercraft Rental, (231) 843-1888. 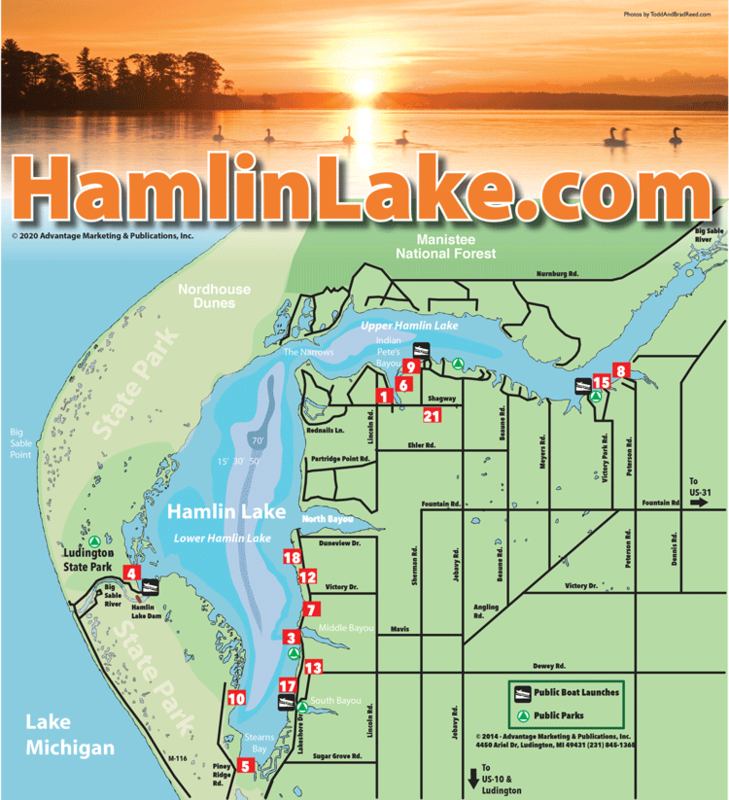 13 - Hamlin Lake Boat Rentals, (231) 843-8497. 2 - Hamlin Marine & Powersports, (231) 845-0001. 15 - Sunset Bluff Resort & Boat Rentals, (231) 845-5002. 17 - Waterside Resort & Boat Rentals, (231) 843-8481. 21 - Shagway Arts Barn, (231) 970-0222. 12 - Carie's Marine, (231) 843-6076. 27 - Refrigeration & Mechanical Services, (231) 843-4564.